It is almost 1am and I am sitting in the living room all by myself. Hubby is in the toilet and Shern is asleep. I am appreciating the quietness now. No baby cries for a moment. I did not pick up Dan Brown's The Lost Symbol to read. I did not switch on the tv. I felt like thinking. I don't know why but suddenly thoughts of my Pho-pho came to mind. My childhood with her. How she raised my up 'til my school days. How I would never ever missed going back to her house every Friday night after that. I still remember clearly how she looked like. I still remember her curly hair. Her kind eyes. Her smell. I always feel sad when I couldn't deliver my promise to her. I remembered promising her she would one day sit in a 'Big car' & stay in a 'Big House'. 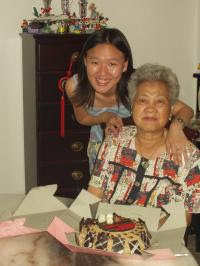 I also feel sad that I did not get to talk to her much during her last days in this world. Although she is now no longer around, she is forever in my heart. I love you Pho-pho - and I always will.